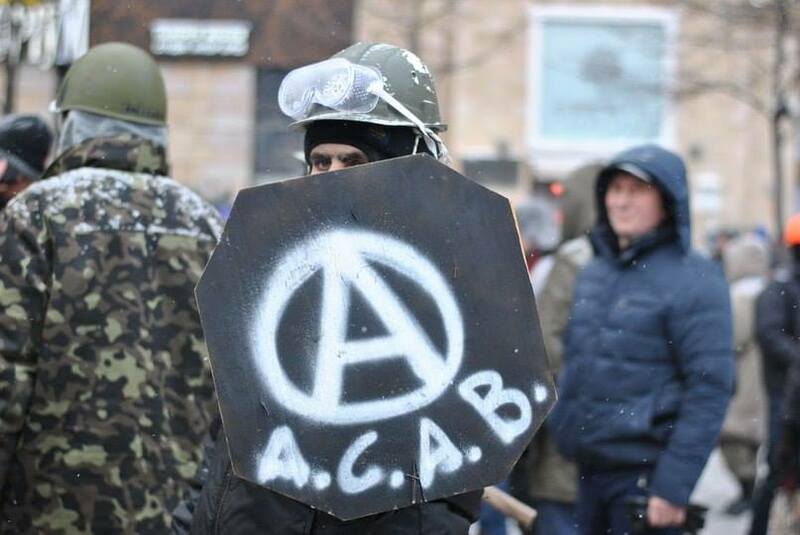 The serious flaws of our left and anarchist tactics in Ukraine (which resulted in its current weakness) can be traced to the early 2000’s and the wrong approach adopted by many of them that time. It is particularly expressed in their permanent, short-term approaches – the desire to get results immediately. How did some of our left drift towards right-wing nationalists and middle-class liberals? It came from ideas of intervening in nationalist groups and hijacking their rallies (not yet numerous at the time). Instead of starting to work from the beginning with the working class (which takes more time), some of left and anarchists decided instead to try and influence pro-capitalist and nationalist movements. This was the desire to choose an easier way, the desire to work in a ‘native’ middle-class environment. When you need a ‘ready-made’ group, you appeal to one that already exists, even though it may be a nationalist group. The flirt with nationalists and middle-class liberals resulted not in hijacking their movements but – on the contrary – it led to a gradual adoption of pro-nationalist views and policy by the liberal left. As a result, we have nationalist-anarchists and nationalist-liberal lefts. The nationalists influenced them, though they expected initially to influence the nationalists. The dilemma faced by the lefts was something like the following: when you see a hundred middle-class nationalists rallying and demanding privileges for themselves, what tactics do you choose? Do you create an opposing group to challenge them and their ideas, or do you intervene and try to influence and hijack the middle-class nationalists concerns? The liberal left in Ukraine chose the latter. But as a result, they were the ones to be influenced, not the other way around. Because regardless of whatever a middle-class nationalist may read or be told, the basis of his/her ‘visceral’ politics is their own class interest; in particular, the desire to secure a privileged status. This perspective began to slide towards the ideology of Nazism. In Ukraine, the right-wing nationalists began to champion the idea of ‘caste systems’ for Ukraine, (Indian style). These theories of ‘caste’ were quite popular among the nationalists some 15 years ago. This idea was promoted by far-right groups. As in the ‘golden age’ of the pre-industrial world, championed by the likes of the UNA/UNSO when headed by Dmytro Korchinsky, society should be divided into agricultural producers and privileged warriors, said the nationalists. And that’s also when swastikas started to blink on the horizon. The ideas of the ‘privileged status’ (a sort-of caste system) resonated quite well with the hidden desire of some on the liberal left, who personally faced the prospect of unemployment and tried to cling to their privileges by all possible means. The result is what we have today–so many of the liberal left caught up in the right-wing nationalist surge and becoming tools in its destructive course. For sure, they don’t publicly champion inequality or exclusion, but they don’t protest, either, when nationalists or even Nazis do the ‘dirty job’ of attacking the potential economic competitors on the basis of race, religion, ethnicity or political views. When those being targeted fight back, the liberal left tries to discredit them while whitewashing the presence of their new-found allies of the right. Sadly and tragically, when the far-right nationalists turn to totally suppress their opposition, the liberal left, too, cannot escape becoming victims. But by then, there may be no one left to defend them. This entry was posted in Articoli e Testi, Deviazioni, English, Europa, Fascismo, Russia and tagged Donbass by VOXKOMM. Bookmark the permalink.